When the Nazis invaded the Soviet Union, the Jews of Lithuania were their first targets in the program known as The Final Solution. In the crowded ghetto of Vilna, many Jews found ways to fight back through involvement with one of the most renowned resistance movements of World War II. After the ghetto was liquidated, survivors of the resistance movement made their way to the forests outside Vilna, where they formed partisan units and continued to sabotage the German war effort, until eventually they participated alongside the Soviet army in the liberation of their city. 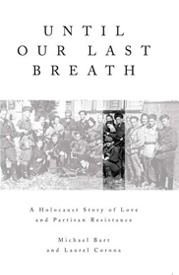 Until Our Last Breath tells the story of the Partisans of Vilna, focusing on one young couple, Leizer and Zenia Lewinson Bart, who met and married in the ghetto and became members of famed poet and activist leader Abba Kovner’s unit, the Avengers. Leizer Bart was in his mid-twenties and Zenia Lewinson was barely nineteen in June 1941, when they were herded into the Jewish Ghetto in Vilna, Lithuania, by the invading Nazis. As the Jewish community struggled to survive, some were already planning acts of defiance against their oppressors. Among them was Leizer Bart. As a member of the Jewish police force assigned to the ghetto gate, he was instrumental in smuggling contraband needed by the resistance. Last Breath at 2010 NIH seminar. He met Zenia Lewinson and they fell in love. Later they made the decision to marry and face the uncertainties of the future together. When the ghetto was shut down and its remaining residents deported or murdered, Leizer and Zenia Bart made a harrowing escape from Vilna and found their way with other surviving members of the ghetto resistance to the nearby Rudnicki Forest. Living in improvised shelters, on food stolen in daring raids on villages, the Avengers and other partisan groups survived a ferocious Baltic winter, emerging from cover to commit acts of sabotage, such as blowing up trains and telegraph lines, to disrupt German communications with the front. As the Soviet forces neared Vilna, the Avengers accompanied them into the city to fight a pitched battle for its liberation. Despite the drama, heroism, and historical magnitude of the subject, perhaps the most compelling aspect of UNTIL OUR LAST BREATH is the genuine love story at its center. Told against a backdrop of unimaginable cruelty and misery, it nevertheless shines with all that is best about being human—the ability to love, and to find the strength to stand up together and be counted when it most matters. Zenia and Leizer Bart remind us that there are always many heroes among us—and sometimes they prevail. Author’s Note: The text of UNTIL OUR LAST BREATH as published is entirely my writing, but I would like to take this opportunity to honor Michael Bart, identified by St. Martin’s Press as the co-author, for his years of research and other efforts on behalf of the book. Mr. Bart provided information about his parents as well as research materials relevant to the topic. He approved all the text before it was seen by others, informing me of errors of fact which I then corrected or rewrote.